Bedroom Furniture Adelaide | Taste Furniture | Zonda Bed - TASTE FURNITURE ADELAIDE | LEATHER LOUNGES | FABRIC SOFAS | DINING FURNITURE | OUTDOOR FURNITURE | BEDROOM FURNITURE ADEALIDE| Beautiful living for indoor & outdoors. The Lugo bed is a modern designer bed that is so unique that a “piece of art” comes to mind when describing this Stunning eye-catching design. If you’re after something special then the Lugo is the Bed design for you. Metal frame with Genuine Leather cover and Brushed Metal feature highlights. Everywhere you look the Lugo is stunning. For more information, photos and pricing please contact our showrooms. Superior Support. Tested to be 4 times the strength of a normal slat systems. If you’re looking to improve the quality of your sleep, you’ll love the quality of our Beds. The superior support provided by our Slat System means no more sagging or broken slats holding you back from the best nights sleep. 4 times Stronger, 72 slats compared to only 26. Allow for three support legs where the weight is, you, your partner,and the middle of your mattress. Better support translates to better sleep. 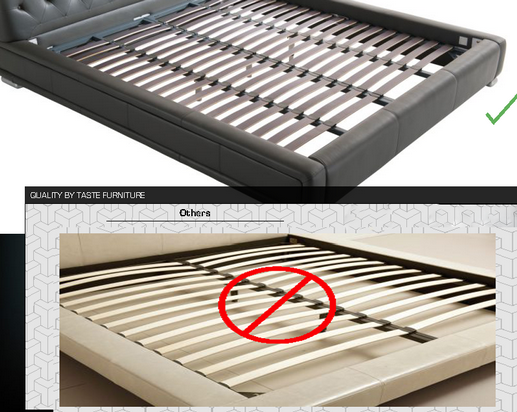 5cm gap between slats compared to 10-15cm supports your mattress like no other slat system. Increasing the life span of your mattress and giving you a better nights sleep. 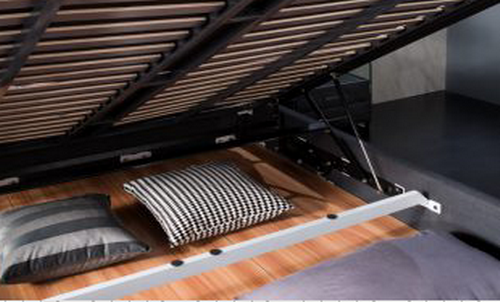 Each covered slat protects your mattress from rubbing on bare timber. Increasing the life span of your mattress.